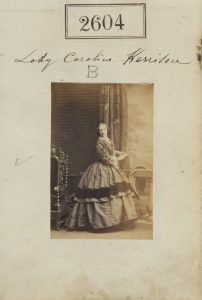 Lady Caroline Margaret Kerrison was elected to the Photographic Society on 2nd June 1853. She became the sixth woman to take advantage of the gesture of equality offered by the founders of this ground breaking society, joining with her cousin, Lady Emily Anne Payne-Gallwey (later Frankland) on the same day. Caroline Margaret Fox-Strangways was the daughter of Henry Stephen Fox Strangways, 3rd Earl of Ilchester (1787-1858) and Caroline Leonora Murray (1788-1819) Her baptism, on 11th January 1819 at Melbury Sampford in Dorset, was followed days later by the burial of her mother on 17th January. Caroline was another victim of the scourge of Georgian England, losing her mother within days of her birth, a fate also suffered by Mary Ann Boulton and Caroline Taylor. Caroline’s early life would be spent at Melbury House, the location of William Henry Fox Talbot’s birth, though the 1841 census documents a 20 year old Lady Strangways and her family at Old Burlington Street, St James, Westminster. Artistic skill was demonstrated at the age of seventeen in her watercolour studies Country girl with water jug and Boy begging, now part of the Royal Collection. On July 23rd 1844 Caroline married Edward Clarence Kerrison (1821-1886) setting up home at Brome Hall, Scole, Suffolk. Sir Edward later became M.P. for Eye in 1852. Lady Caroline planned the garden, terrace and artistic topiary plus designing cottages on the estate. Their time was shared between Brome Hall and their London mansion at Great Stanhope Street where “fashionable entertainments” were hosted including a grand ball with over 300 invited guests. In 1853, on the death of General Sir Edward Kerrison, Caroline and Edward inherited Oakley Park, Suffolk plus several other freeholds in Great Britain. Caroline joined the Photographic Society in the same year, 1853, proposed by John Dillwyn Llewelyn (1810 – 1882) and seconded by Roger Fenton (1819-1869). She did not, however, exhibit any photographs throughout her membership from 1853 to 1857. As a member of the Fox Strangways family, Caroline was well connected to an early photographic network of relatives and friends, many of whom adopted the new art of photography. Caroline’s sister, Lady Theresa Anna Maria Digby (1814-1874), became one of Queen Victoria’s Women of the Bedchamber and was the subject of a watercolour painting by her Majesty.The Queen’s interest in photography was shown as early as April 1839 detailed in letters from Lady Theresa to William Henry Fox Talbot. Lady Caroline and Sir Edward were enthusiastic patrons of innovative architect E. B. Lamb. Architectural patronage of Lamb was echoed by the Frankland Russell family, once again uniting Caroline with her cousin Emily Anne Payne-Gallwey (later Frankland). A Reformatory for boys in 1856 in the village of Thorndon, later named Kerrison Reformatory, was designed by Caroline and in 1864 she published some of her designs in Plans and Estimates for Labourers’ Cottages. This was a collection of sketches illustrating her cottages and hand written text “…designed to combine substantial comfort to the tenant…”The Kerrison approach to landlord-tenant relations fostered trust and confidence. Sir Edward believed that “one of the first matters of social progress” was “the education of the people”. 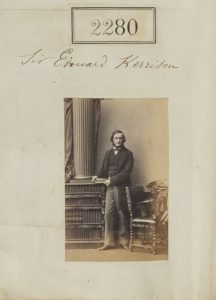 The Kerrisons kept distinguished company, entertaining the Prince and Princess of Wales in 1866.Regular reports appeared in the national press documenting notable visits to Brome Hall in Norfolk. Lady Caroline Margaret Kerrison spent her later years at 51 Berkeley Square, London where she died on 26th January 1895. 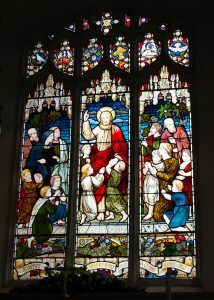 My grateful thanks to Peter Lee for additional information regarding the history of stained glass at St Peter and St Paul, Eye.